Fantastic Dress up Doll Sandra comes with her own bright Pink wardrobe full of clothes. Strong well made clothes give Sandra a great choice of 11 mix and match outfits and teaches little fingers to do up poppers. Sandra has durable, flexible arms and legs making it easy to get her dressed. 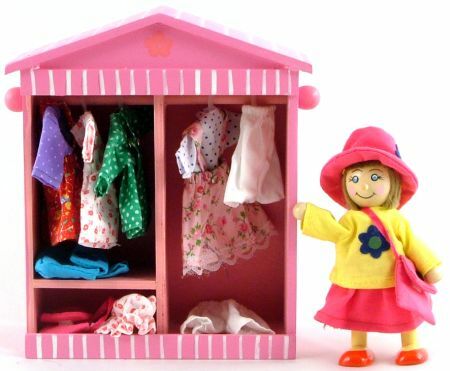 The wardrobe comes with small coat hangers so little ones can hang Sandra's clothes up when they have finished. Maybe they will learn to hang up their own clothes...? We live in hope! Little girls adore this toy and I often see 'older girls' looking longingly at it too. Size: Sandra is 12cm High. The Wardrobe is 19cm High by 15cm Wide. We like this because: "It doesn't get any pinker than this!